Concurrency control is one of the main aspects of multi-player games where all the checks, conditional writes and game state updates must be made as fast as possible and with minimal client/server calls in order to keep the game fair and square. This is especially critical in turn-based games where careless implementation (such as putting code that alters the game state in the client) can lead to concurrency related “race condition” from creeping in. In this post we will look at a web-based tic-tac-toe game with multiple players playing against each other at the same time. 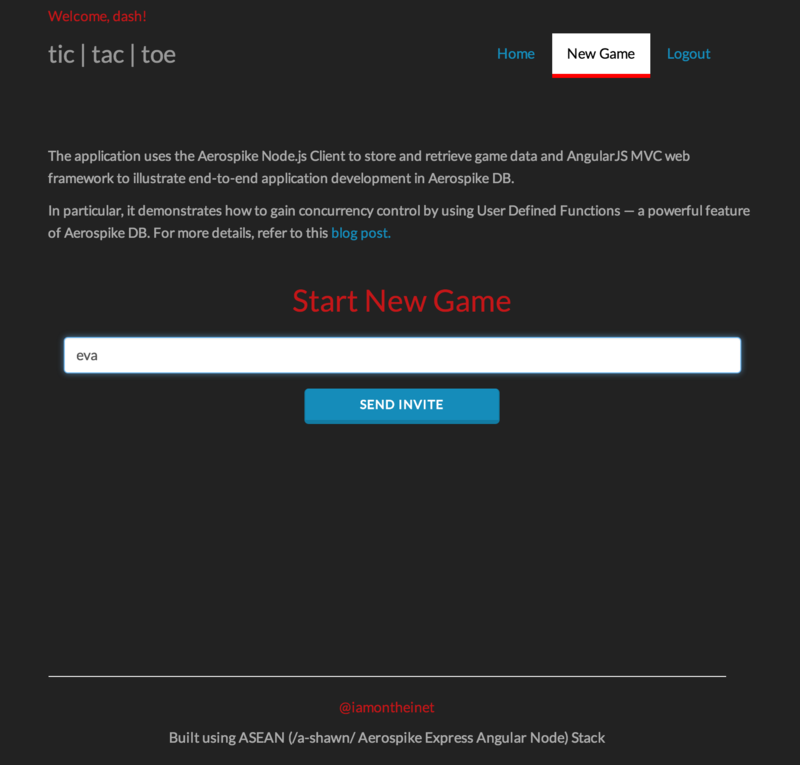 This application uses the Aerospike Node.js Client to store and retrieve game data and AngularJS web framework to illustrate end-to-end application development in Aerospike DB. 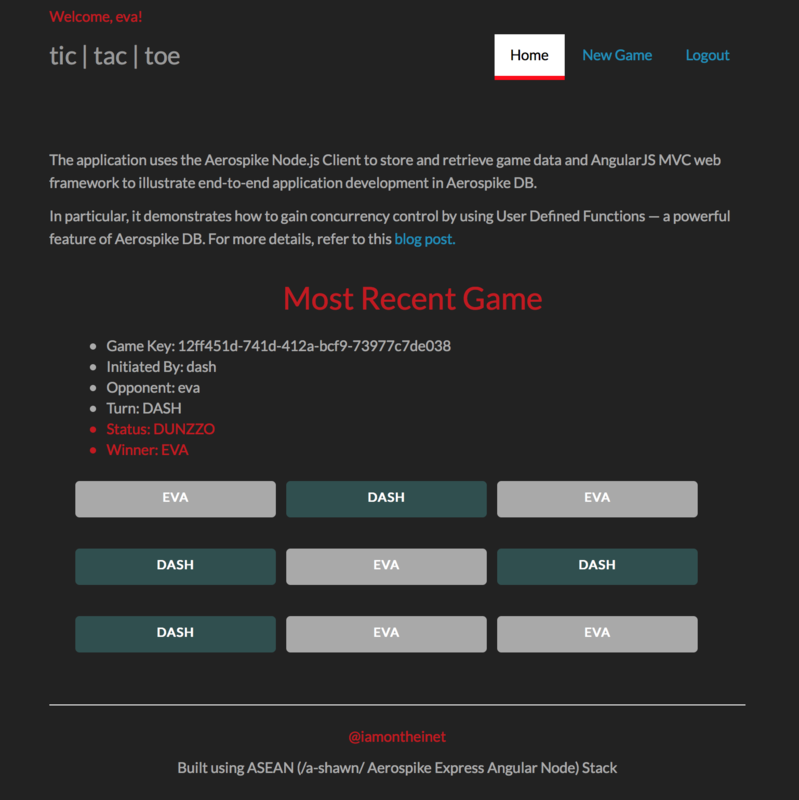 In this application, concurrency control is achieved by putting conditional writes and game state updates on the server using User Defined Functions. UDFs are a powerful feature of Aerospike DB and they can be used to extend the capability of the Aerospike DB engine both in terms of functionality and performance. For more information on UDFs, click here. But wait, there’s more! Since the UDFs reside and execute on the server, the logic within it gets executed closer to the data with minimal client/server calls. Effectively providing much better performance in addition to concurrency control. BooYah! Even though this is a pretty lightweight application, I’ve used different technologies to make it decent enough – visually & functionally – and covering all aspects as well as walking through the entire codebase is beyond the scope of this post. So, good understanding and working knowledge of the following technologies is presumed. NOTE: Users are notified of new game invites in real-time via Socket.io. Therefore, in this version of the application both users must be logged in to see the invites. In the future, I will enhance the app such that users will be able to see all pending invites as well as games they’ve already played. Stay tuned! Is the game already over? If so, is there a winner and who won? Is it current user’s turn? Is the selected square already taken? Before we get to the code, let’s examine the data model. This is important because data modeling is key to having a well performing application with data models at the core. Data models not only define how the data is structured and stored but sometimes they also tend to drive the UI and UX of the application. In Aerospike DB, a Set (similar to tables in traditional RDBMs) is a collection of records, and each record is a collection of Bins (similar to columns in traditional RDBMs.) In this tic-tac-toe example, the application stores all game data in a Set called “games.” When a user initiates a new tic-tac-toe game by inviting another user to play, the application creates a new record in the “games” Set. gameKey Stores unique ID generated by the application. It is set once when the record is created. 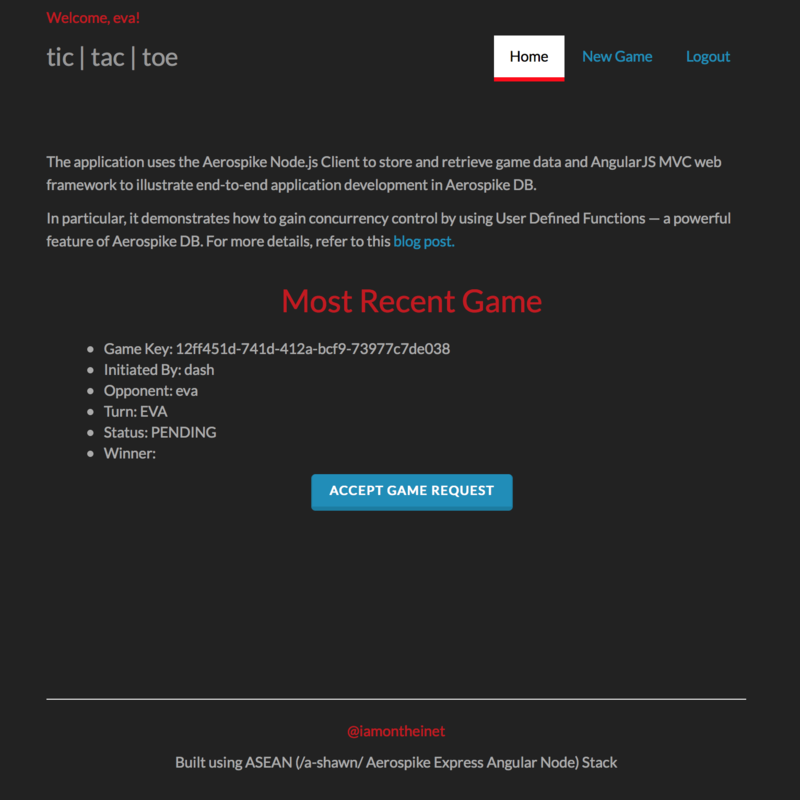 initiated Stores username of the user initiating the game. It is set once when the record is created. opponent Stores username of the user invited to play the game. It is set once when the record is created. turn Stores username of the user whose turn it is to make the next move which could either be the initiator or the opponent. Initially set to the opponent and then updated with every turn/move. winner Stores username of the user who won. In case the game is tied, it will retain its default blank (“”) value. TopLeft Stores username of the user who picked that square. Initially set to blank (“”) value. TopMiddle Stores username of the user who picked that square. Initially set to blank (“”) value. TopRight Stores username of the user who picked that square. Initially set to blank (“”) value. MiddleLeft Stores username of the user who picked that square. Initially set to blank (“”) value. MiddleMiddle Stores username of the user who picked that square. Initially set to blank (“”) value. MiddleRight Stores username of the user who picked that square. Initially set to blank (“”) value. BottomLeft Stores username of the user who picked that square. Initially set to blank (“”) value. BottomMiddle Stores username of the user who picked that square. Initially set to blank (“”) value. BottomRight Stores username of the user who picked that square. Initially set to blank (“”) value. It’s time to look at some code. In Aerospike DB, UDFs are written in Lua. Lua is a powerful, fast, lightweight, embeddable scripting language. For more information on Lua, click here. Below are the contents of UDF (/lib/udf/updateGame.lua) that checks, sets and updates state of the game in a single-record transaction manner. It accepts three parameters and returns a map with attributes status and message back to the client. result['message'] = "THIS GAME IS DUNNZO -- NO WINNER!" result["message"] = topRec["turn"] .. " goes next. NOT YOU!" result['message'] = "That square is already taken. IT CANNOT BE YOURS!" For every move (i.e. user selecting a square) all the client has to do is execute the UDF by passing in the game record key, current user’s username and the square he/she just clicked on. 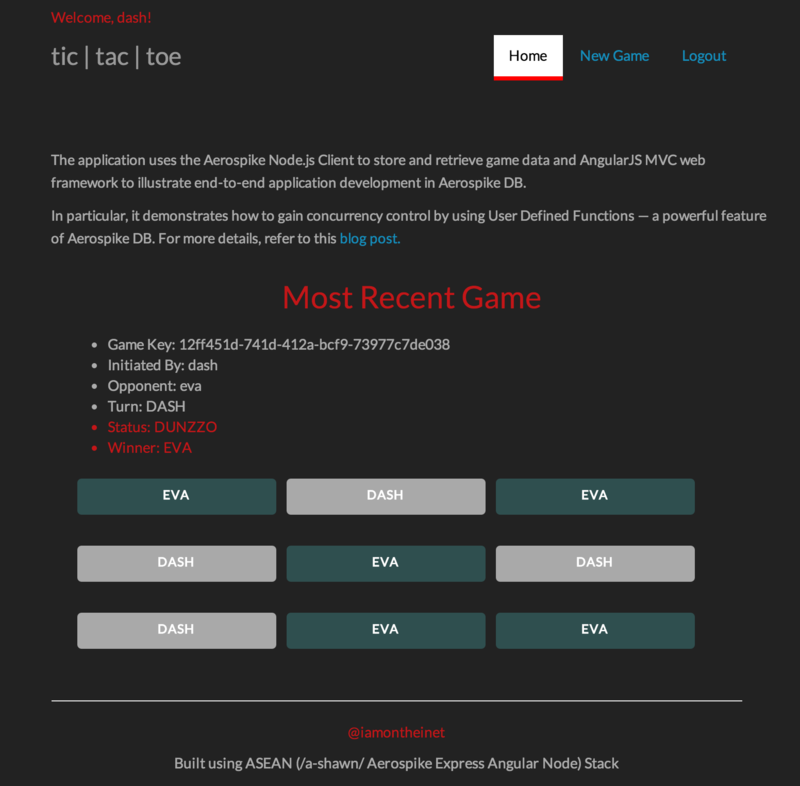 The UDF then takes care of the rest — checking, setting, and updating the state of the game in a single-record transaction — where it always interacts with the most recent (game) record unlike other implementation where conditional writes and updates are coded in the client; where the client can potentially operate on outdated game record and wrongly overwrite true state of the game. So, Where’s The Entire Solution And How Can I Get My Own Game Going?